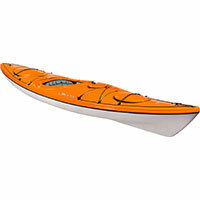 A very capable, fully outfitted, and well proportioned smaller sea kayak with excellent initial and secondary stability. Designed to fit a wide range of paddlers (beginner, intermediate and advanced) wanting a high level of performance in a smaller lighter package. The Delta 12.10 has all the features found in all our longer touring sea kayaks, including front and rear hatches and bulkheads for safety and dry storage. 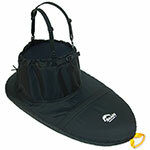 Its lightweight, yet rugged, construction make it an excellent choice for loading on and off a car, sailboat or motor yacht. The outfitting of the Delta 12.10 is top of the line with watertight hatch covers, full deck rigging, comfortable carry handles, adjustable form fitted seat, integrated thigh braces. And just like composite kayaks which might cost $1000 more, thermoformed kayaks have nice thin bulkheads so you don't waste all your good storage space on six inches of foam bulkheads. From Anonymous of Churchton, Maryland on 8/9/2013 .